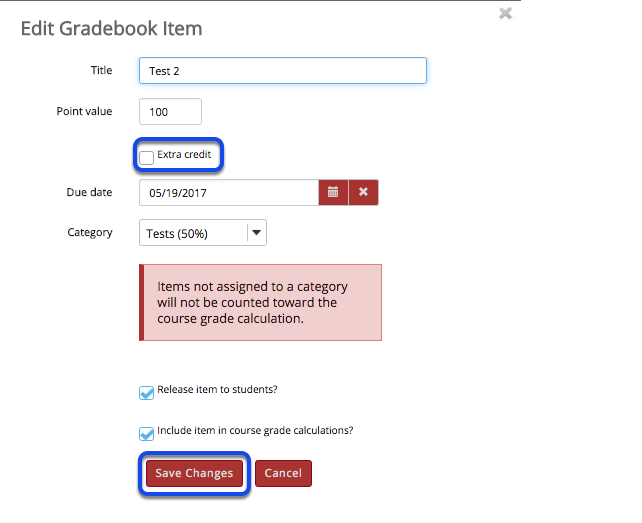 Instructor User Guide GradebookHow does extra credit work in Gradebook? Zoom: Setting EC at the category level. Quizzes are worth 100 points each. The total points possible for the scenario above would be 400 points possible (i.e. 4 quizzes at 100 points each). The EC quiz does not factor into the total "out of" points possible, so the total points remain at 400. If a student were to score 100 points on all 5 quizzes, that student would have a course grade of 500/400 points, or 125%. The 100 points for the extra credit quiz are added on top of the total points for the other items. Note: If a student scores 100/100 points on only 4 of the 5 quizzes, skipping either the EC quiz or one of the other quiz items, that student would have a course grade of 400/400, or 100%. The EC item can "replace" or make up for another score if it is worth the same amount of points.